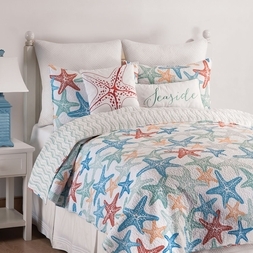 The ocean is calling you with this beach-themed quilt set. Featuring printed starfish in ocean blue, seafoam green and coral on a white quilted background. Fully reversible to an aqua pattern simulating waves for two looks in one! Shams feature the starfish. 100% cotton throughout, this finely stitched quilt will be the perfect choice all year round.